Even if you're not the religious sort, you should visit the magnificent churches of Barcelona. The Sant Pau del Camp is a rare example of Romanesque architecture, with a fantastical façade and extraordinary cloister. 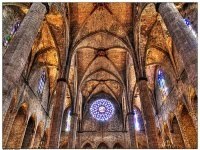 The graceful basilica of the Santa Maria del Mar is perhaps the best surviving example of Catalan Gothic, and makes a great place to go for a classical concert. And the holy architecture of Sagrada Familia will lift your heart to the heavens. Take your time to explore these beautiful buildings, you might even become a believer. 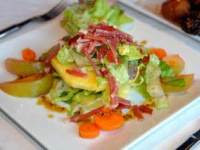 For a taste of Catalan cooking, visit the Cinc Sentits, which is creating quite a stir in Barcelona gastronomic circles. The owners promise to tickle all your senses with gourmet dishes. The menu is a mix of classics such as suckling pig with apple compôte, or Catalan flat coca bread with foie gras, and individual dishes such as lamb cutlets with a crust of porcini dust, and slow-braised pork belly on gingerbread. Save room for the apple sorbet and maple quesada (far better than cheesecake), or the artisan Catalan cheese plate. The wine pairings are impeccable. Barcelona is the perfect place to indulge in sweet treats. You'll be spoilt for choice with its selection of confectionery shops. For posh chocolates in fancy packaging, head to Escribà; and for cooked candy visit Papabubble, where you can see the sweets being rolled in front of your eyes. If you're over in Spain during the winter and fancy a hot chocolate, stop by the milk bar La Granja (Banys Nous 4), handsomely fitted with antiques, it serves thick and frothy cocoa, which will warm you up. Barcelona's love of Modernista has been a passionate affair and the evidence is scattered across the city. In the Dreta area of Eixample, there are some masterpieces. The fairest of them is Gaudí's luminous Casa Batlló, built for textile tycoon. Nearby, you can gaze at his rivals' architecture: the shiny Casa Amatller by Puig i Cadafalch, which houses the Centre del Modernisme, and the decadent Casa Lleó Morera (on the corner of C/Consell de Cent at No.35) by Domènech i Muntaner. 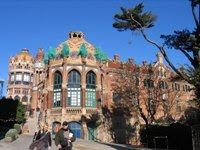 Nearby, you'll find his Hospital de la Santa Creu i Sant Pau, whose city gardens offer a pleasant oasis amid the bustling city. This UNESCO World Heritage Site has 18 pavilions. Style comes with all kinds of price tags in Barcelona. High street shopper s will easily recognise the Spanish labels Mango and Zara, but fashionistas should check out Custo Barcelona for its trademark bright T-shirts, and MTX Barcelona (Rec 32) for its restructured womenswear. These are not cheap, but they are certainly designer originals. Those with a yen for footwear should spring to the Mallorca-based eco shoe company, Camper, which is famous for its clog heels and bowling shoe classics.